Similar to a vinaigrette in terms of its flavor profile, tapenade is a condiment that people often buy jarred, but it’s very easy to make tapenade from scratch at home. It’s a great way to add the punch of olives to sandwiches, entrees, or toasted bread. Simply combine everything in a food processor and process until it reaches your desired consistency. 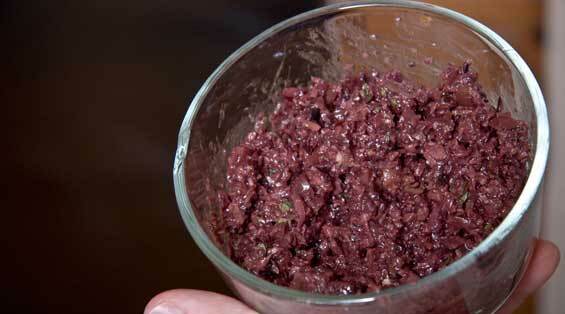 If possible, let the tapenade sit in the fridge to marry flavors for a few hours before serving to improve its taste. For a more rustic tapenade that contains large pieces of olive and sits nicely on the plate, simply pulse to chop until your desired chunk size has been reached. If you reach your desired chop size, but the mixture needs more oil to reach the right consistency, move the tapenade to a bowl and fold in more oil by hand. You are looking for a sheen from the oil and a slightly loose consistency. For a finer, spreadable tapenade, puree the mixture in a food processor while drizzling in additional oil until a fine paste is formed. We used Kalamata olives because of their tangy flavor, beautiful purple color, and relatively easy availability. However, others can be used. 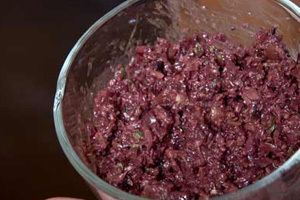 Using different olive varieties will change the color and flavor of the tapenade. You could even try blends! We recommend Cerignola, Arbequina, and Castelvetrano olives. We prefer champagne vinegar for its crisp, clean flavor that brightens up the olives. However, if you wanted to give your homemade tapanade a richer, more fruity flavor, you could substitute (try smaller quantities first to make sure you’re not overwhelming the olives) aged balsamic vinegar or fruit vinegars. Finer oils tend to bring better and cleaner olive oil flavor to your tapenade, so this is the time to use the good stuff! Adding sundried tomatoes, boquerones, or increasing the amount of garlic will take your tapenade in new and interesting directions.